BMW 120d M Sport. 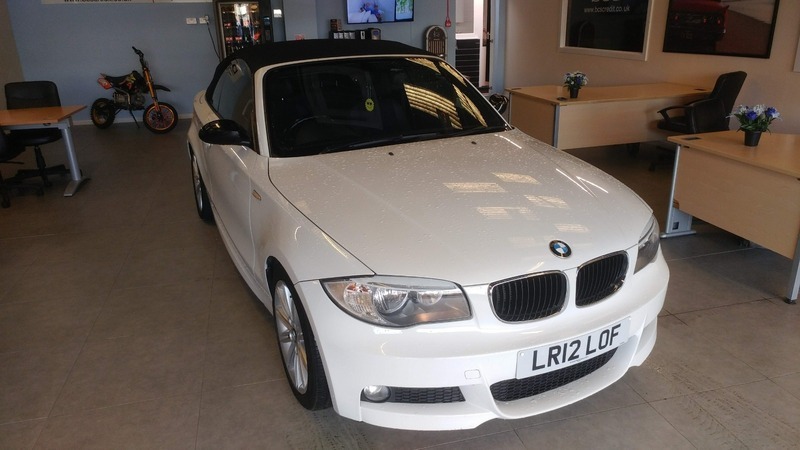 This is a great car, White is the colour of choice for most people at the moment and it makes this 1-series convertible really stand out.This fantastic convertible is suitable for families due to the 4 seats but equally as good for anyone looking for a fun car without huge running costs, The 2.0 Diesel engine offers 174 BHP whilst returning 56.5 MPG and is only £140 per year to tax, this is a great driving experience which wont break the bank on a daily basis. The car is over 6 years old and has covered around 8k miles per year on average since new which is brilliant for a diesel such as this made for longer journeys. This car is made to be driven, it has a fantastic ride due to it's sports suspension. Spec includes climate control, front fog lights, isofix, parking sensors, privacy glass, rain sensor windscreen wipers, start stop system, multi function steering wheel controls and more. Get ready for the summer now with this fantastic car, this car has had a previously registered insurance claim on HPI, hence we are selling a fantastic car at a great price with a 6 months warranty and 12 months breakdown cover. All our cars at BCS come with a 6 month comprehensive warranty and 12 months complementary breakdown cover.